Regular Tarot Bags - Pharaohs Regular Tarot Bag - Tarot Bags, Tarot Cards, Cloths, & More! Sketched from actual artifacts discovered on archaeological digs that are now housed in museums, the images of six Pharaohs and Egyptian queens are scattered over this black cotton fabric. Perhaps, the depiction of these ancient rulers on this bag will even provide an ancient and highly symbolic mysticism to aid the readings done in its presence. We also have a matching Pharaohs Reading Cloth. 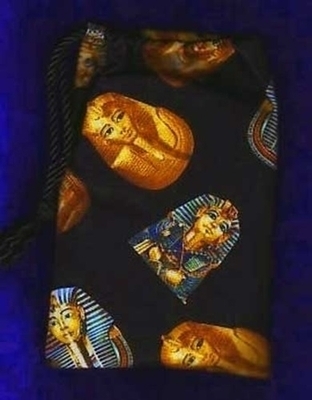 Deck Suggestions: Many decks have a goddess or world culture theme that would match wonderfully with this bag, but Egyptian themed decks are ideal!